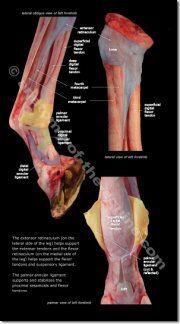 The success and handiness of our original Hoof Anatomy Pocket Guide, led us to create this expanded, in-depth guide to the equine distal limb. 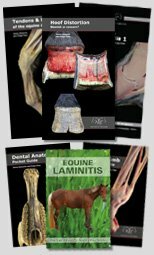 Once again, we have used high quality, full color, anatomy postcards to create a fantastic teaching tool for vets, farriers, trimmers and body workers. However, this time we opted for the jumbo (6"x11") size to give space for more detail. 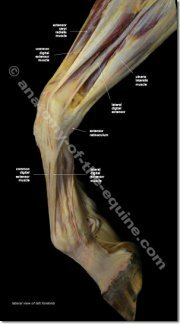 This is an in-depth guide to the equine distal limb. The images have been carefully collected to visibly show the function of the structures and ease the task of explaining difficult concepts. The heavy duty card and spiral binding makes this guide very rugged so it can be easily used as a portable teaching tool. 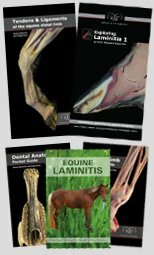 We are sure you will find it an invaluable aid in educating your clients on the complex nature of the distal limb - communicating clearly with clients inspires trust and confidence in your ability to help their beloved horse. Demonstrating and sharing knowledge is vital to the health and longevity of your business and having this handy resource at your fingertips will help you achieve this goal. Featuring careful dissections and crystal clear photography, along with a high level of attention to detail in the design, this Guide provides a level of professionalism that far surpasses the norm. Also available as a Digital Book (eBook) that can be viewed on any computer or mobile device. 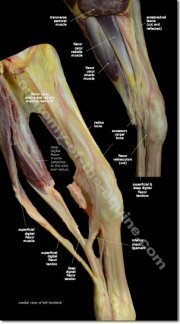 A beautifully dissected lateral view that clearly illustrates the complexity of the equine forelimb. The slight flex to the leg highlights the connections of the extensor tendons to the corresponding muscles in the forearm. 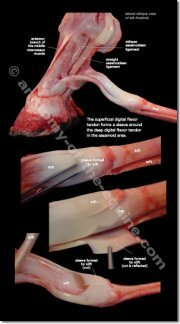 This exacting set of photos is particularly useful for showing the muscle bellies of the deep digital flexor tendon and the superficial digital flexor tendon. 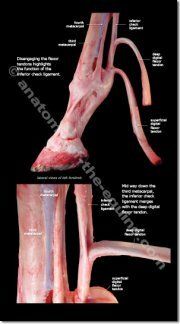 It also illustrates the role of the inferior check ligament and how the accessory carpal bone plays a vital part in protecting the flexor tendons from over-extending. Through the clever use of color overlays these photos reveal the function of the thickened deep fascial membranes known as retinaculums and annular ligaments. It is clear to see how these structures are designed to support the tendons when the leg is in motion. 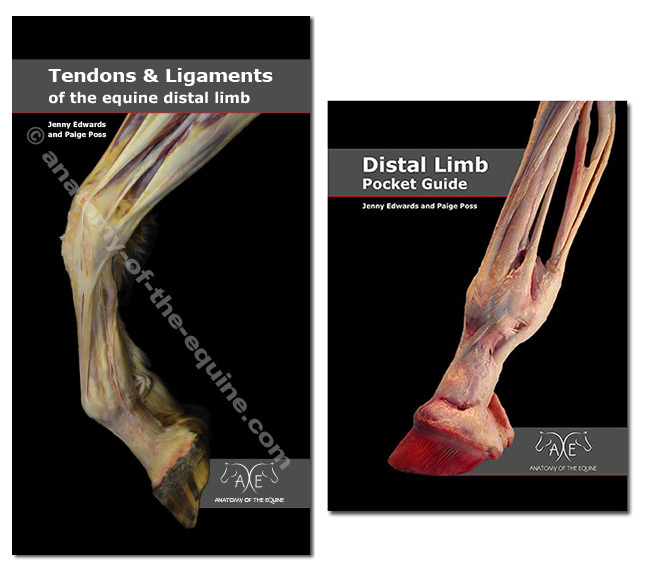 The multiple layers of the annular ligaments add support to the fetlock and pastern. This helps your client understand how many structures can be affected by injuries and hoof imbalances. Designed to show how the inferior check ligament (ICL) attaches behind the knee and is tucked in between the splints. The ICL directly connects to the deep digital flexor tendon, but also loosely connects and supports the superficial digital flexor tendon. Particularly useful set of images when explaining check ligament problems. Disengaging the flexor tendons highlights the function of the inferior check ligament. 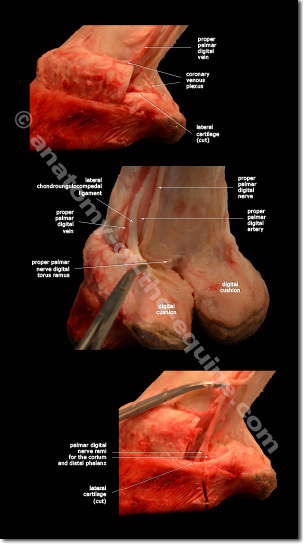 Useful images when discussing check ligament surgery for laminitis and club feet. 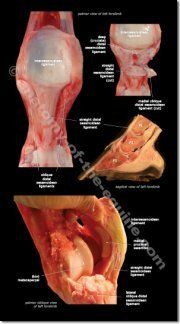 This set of images is particularly useful in showing structures of the suspensory apparatus in the pastern. 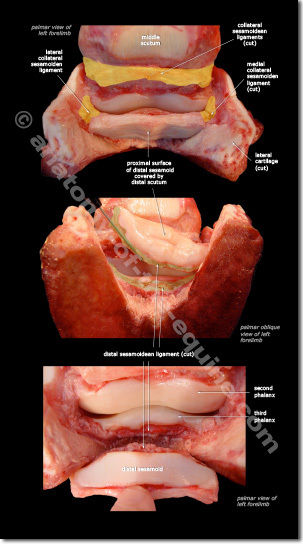 The multiple layers of ligaments are especially clear in the top image. Unique, detailed images of the 'sleeve' created by the sdft surrounding the ddft. 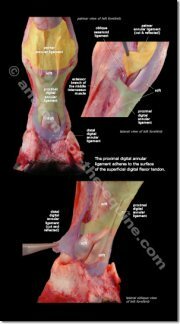 The superficial digital flexor tendon (SDFT) is responsible for flexing the pastern. 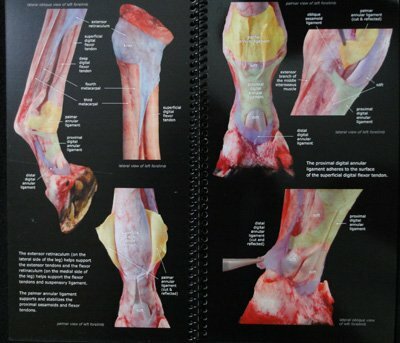 These images demonstrate how the SDFT branches in the pastern area and attaches to either side of the middle phalanx. The middle scutum forms a flat, sliding plate for the deep digital flexor tendon. These images are organized to help envision how the suspensory ligament functions as a unit. 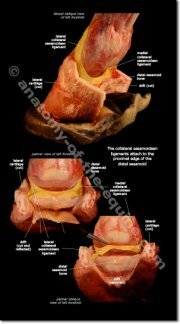 These photos expand on the previous set, detailing the suspensory ligament and the connection to the sesamoid bones. 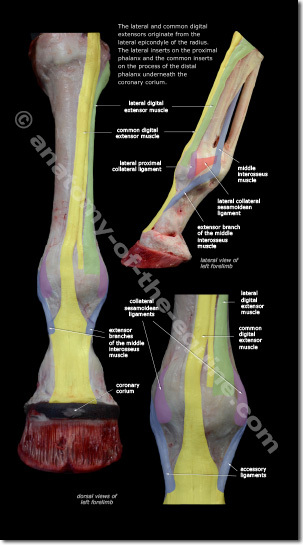 The layers of ligaments that stabilize the sesamoids to the pastern reveal their intricate nature. The connection between the common extensor tendon and the suspensory ligament is key to the support of the fetlock during extension of the limb and a vital part of the stay apparatus during stance. Color highlighs show how the structures relate and where they interconnect. 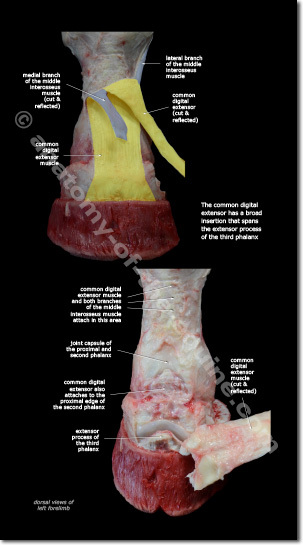 Detailed images of the attachment points of the common extensor tendon. Exceptionally useful images when discussing the effects of distal decent of P3 on the soft tissues beneath the coronary band. Some of the most unique and informative images in this book. The navicular bone is buried deep within the hoof capsule and its support structures are often misunderstood. 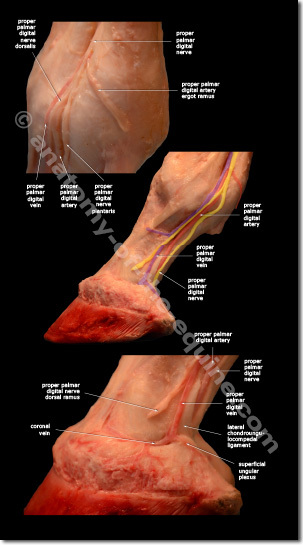 These images show how the collateral navicular ligaments attach along the top edge of the bone and wrap around to the front of the pastern. Particularly useful when discussing horses that suffer from navicular problems. Helps owners understand how problems often involve more than just the bone. 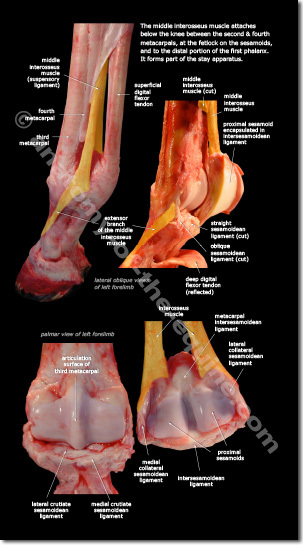 Detailed images of the ligament attachments of the navicular bone. 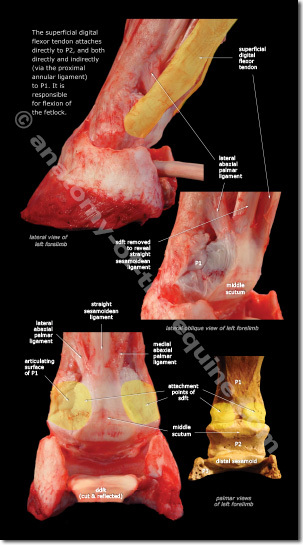 Particularly useful for understanding the complexity of the navicular region of the hoof. Beneath the first layer of fascia lies a neurovascular bundle. 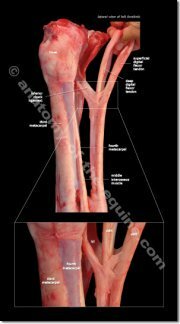 These veins, arteries and nerves branch out and cover all aspects of the hoof. These images are wonderful for teaching owners where to find the digital pulse on the laminitic horse. Detailed images of the nerves as they dive within the soft tissues of the caudal region of the foot. 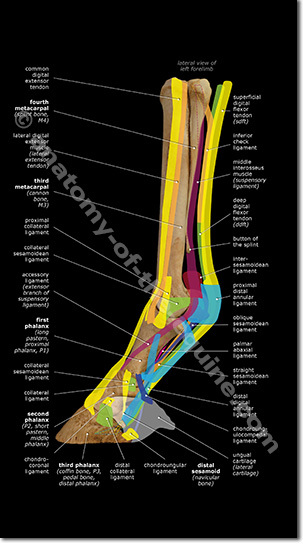 Colorized diagram of the tendons and ligaments of the equine distal limb assembled to view the various layers. Proper and common names of each structure are given for quick reference to alternative terminologies. 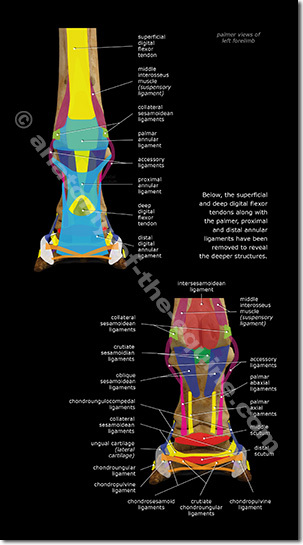 Diagram of the tendons and ligaments of the equine distal limb assembled to view the various layers as seen from behind. Proper and common names have been listed for quick reference. 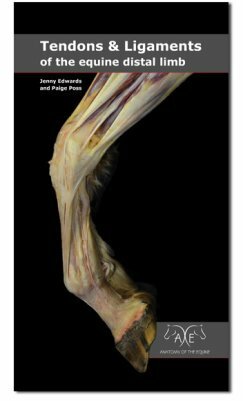 Buy the Tendon & Ligament Guide along with the Distal Limb Guide and save $10 on the combined price and we'll give you a free copy of the Coffin Bone eBook too.